No studio is attached to the project yet, but Wolff is reportedly slated to executive produce. Michael Wolff's "Fire and Fury" flew off shelves this past month, and now it could become a television series. According to The Hollywood Reporter, the book's film and television rights were bought by an entertainment-focused holding company. No studio is attached to the project yet, but Wolff is reportedly slated to work on the project as an executive producer. If the television project goes through, it would join two existing TV shows about Donald Trump's presidency. Comedy Central's "The President Show" and Showtime's upcoming "Our Cartoon President" both portray Trump as unfit for office. A "Fire and Fury" series would likely be no different. 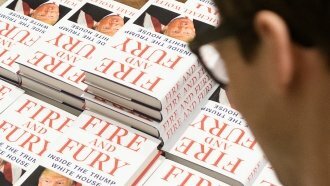 The book's portrayal of a chaotic West Wing quickly drew the ire of Trump; one of his lawyers tried to halt the book's publication with a cease-and-desist letter. And Wolff's faced scrutiny for several inaccuracies in the book. Because of that, something tells us a TV adaptation wouldn't come without at least some controversy.